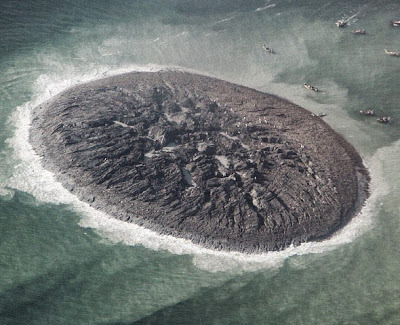 A new island composed of mounded sediment recently emerged off the coast of Pakistan. It was created by a mud dome following a powerful 7.8 magnitude earthquake. Mud domes occur when liquids, gases, and solid materials are geo-excreted due to the jostling of seismic activity. The occurrence of mud domes correlate to a subduction zone like the Makran Trench, where tectonic plates boundaries like the Eurasian plate and Arabian plate converge. "Our knowledge is a little island in a great ocean of non-knowledge." The 7.8 magnitude earthquake is believed to have loosened sediment above a cache of subsurface natural gas allowing un-trapped gas to rise. The rising gas transported mud, rock, and sand upward to create the dome that is visible today. Perhaps wind and wave erosion will eventually cause the island to disappear beneath into the sea. For now, the island is about 100 yards in diameter and rises 65 feet above the sea. Images From Space Confirm Pakistan Earthquake Created New Island, by Betsy Mason. September 27, 2013. The World's Newest Island, by Phil Plait. September 30, 2013.